Dear Coach…thank you for working with these boys. It must be a huge investment of time, money and energy to get 9+ boys on the same page, especially in this day and age. I genuinely appreciate your effort, love of this sport and teaching them this wonderful game. Without you…there’d be no need for me. Again, thank you. Dear Grandparent…I get it…you’re a GRANDPARENT and you love your grandchild dearly…but to yell “call it both ways” when you don’t like a call implies that I’m being a dishonest umpire. A crook. On the take. That I’m conspiring to favor one team and not the other. I can 100% guarantee you that isn’t the case. I don’t care who wins, I really don’t. I’m there to be a fair and impartial observer and enforcer of the rules. I put in many, many hours of training, reading, observing, being mentored and, quite honestly, my honor is on the line. I’ve worked years to get here and I don’t plan on giving it up any time soon…so shut up would ya? Dear Parent….thank you for letting your son play. It must be an expensive deal paying for uniforms, training, bats, helmets, windbreakers, food, travel, lodging, snacks and tournaments. It’s so complicated now and I appreciate you and your family’s commitment. For sitting through hours and hours and hours of games on your weekends off in rain, wind, more rain and hot humid days. Without you there’d be no need for me. THANK YOU!! Dear brother/sister of the ball player….thank you for hanging out during the games that your sibling is playing in. It must be boring….but I was watching you the other day (in-between innings) and chuckled as you ran full speed on the high school track and jumped onto the high jump matt and bounced off. I smile silently as you act your age and roll down the hill behind the third base dugout…shrieking and giggling the whole way down. I eavesdropped on your conversation behind home plate with your grandpa when you told him that you’ve been practicing kissing boys at school and when he asks “why..?” you reply “…cause they let me catch ’em..that’s why! !” I watched you wrestle with other kids, or do cartwheels in the grass behind the first base bleachers. Sometimes…just sometimes….I bet that you’re having more fun than the ball players on the field. Dear Assistant Coach….I appreciate your efforts, though this isn’t Yankees versus Red Sox. Its eleven year olds learning a complicated game with weird nuances and silly sayings. Can of corn? Trade places with him. Ducks on a pond? BINGO!! Load up! Wear it!! What I want you to do is…assist the head coach. I don’t want your help on a call nor any tantrums. Relax. They’re ELEVEN. Dear Coach….I got this. I know that you’ve had bad umpires before. I know that some umpires don’t hustle, don’t know the rules (and their exceptions) and are bad for the sport. I’m not one of them. I show up early. I shine my shoes before every game. I contact my partner the night before to ensure that we meet at the field at the same time AND wear matching shirts. I hustle to get the angle. From behind home plate I go from a crouch to a sprint as I run down the first base line several feet looking for a pulled first baseman’s foot on an infield hit. I do what it takes to get it right. I LOVE officiating. You coach. I’ll officiate. It works best this way. Dear Concession Stand Volunteer….thank you for your countless hours in (usually) hot and cramped conditions. You’re usually the friendliest of everyone at the field and you give me free water and free hot dogs. You running the money-making concession stand enables athletic departments to afford new stuff and new stuff makes people happy…including the stinky, sunburned, bug-bitten, bruised and stiff-legged umpires who get to drive home with a refreshing drink and full stomach. Two words…YOU ROCK!! Dear Player…a little secret for you….I’m your biggest fan. True story. I want you to hit the ball. I want the defense to have to make plays…and when they do…how great is that?! I want you to throw that curve on an 0-2 count and watch it drop into the strike zone just before the plate and catch the batter off guard and have me bellow “THREE!! !” and ring up the strike out. I like it when you take a low throw at first base, scooping it out of the dirt all stretched out while staying in contact with the bag and holding up your mitt as I hold, pause…then yell “OUT! !” I like it when you steal and I like it when you throw the runner out. Oh boy do I like it when you hit it to the outfield and make them run and the infielders set up cut off men. I like it when you hustle and I love it when you tell the other player “good hit”. I know then….you’re coached right. Dear Catcher….you’re my favorite. I won’t lie. You’re the only player that I shake hands with prior to the game. When you protect me from getting hit with a pitch that’s heading straight for my face and I have to stay put and assume that you’ll reach up and catch it inches from my face and then you do…? I love that. I tell you under my breath that the last pitch was low and outside so that you can tell your pitcher and coach what I saw without me addressing him personally. You’re my liaison to your dugout. I like it when your pitcher is having trouble with his pitches and bouncing the ball around home plate and you BLOCK it with your little body (even with no one on…) and I don’t get hit….I really, really appreciate your effort. You’re a tough little dude…and smarter than most of the other players. I’ve been hit with pitches and foul balls. They hurt. They stun. They bruise. Its an occupational hazard that both of us understand and willingly undertake for the game that we love. My only hope is that you’re having as much fun as I am. Dear Groundskeepers….you’re the unsung hero’s of the game. You drag the field. Chalk the foul lines and batters boxes. You put in the bases at the correct distances. You prepare the pitcher’s mound. You weed, spray and mow the grass. You paint the dugouts. You water down the infield. You knock down the wasp nests in the dug outs and take the birds nests out of the scorekeepers stand. You work tirelessly to make it pretty for the game then show up afterwards to cover home plate and the mound with tarps. 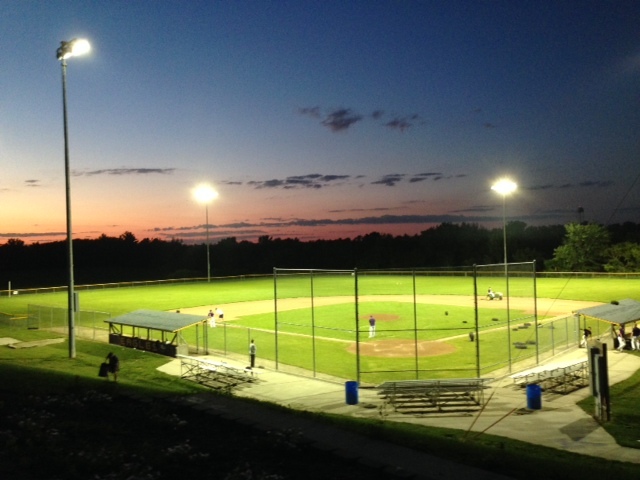 You turn on the lights around dusk and chase down foul balls that end up in the corn field. You empty the trash cans and use leaf blowers on the bleachers to clean them up. A lot of the time its the head coach and his assistants that assume these duties…and for little notice. Thank you…whomever you are. Dear Coach/Parent…I’m human. I occasionally get a call wrong. I don’t mean to, it just happens. I won’t change it, don’t ask. I feel terrible when it happens but the game goes on regardless. I have to put it behind me quickly and proceed in a way where it won’t happen again. If asked by a coach about it later on I’ll admit that I kicked it. Humble pie. I’ve found more willingness in coaches to move past a call if I’m straight up with them about it. I’ve never had a coach throw it back in my face. I can guarantee you that I’ll rehash it over in my mind for hours in the days that follow and learn from my mistake. Dear Scorekeeper…thank you for being honest and recording the various numbers. We rely on you to be our safety net when things go sideways…which happens when we least expect it. Your watchful eye and attention to detail assists us in unsung ways. Thank you. Dear Player…I want you to be safe, period. Sometimes I’ll ask you to do something….like wear a helmet when you’re standing in the doorway of your dugout…that’s for your safety in case a line drive foul ball heads your way. “Its hot” I get it….but you’re on my field son. Nothing, nothing could make me feel worse than you getting hurt. I mean it, that’s why I stop games if it gets too dark to play or I hear thunder or see lightning. I want you to be safe…regardless of what some adults say about it being “okay to play” in those conditions. Dear Partners….thank you for everything. The work. The laughs. The great calls. Your friendship. For what you’ve taught me. For sharing your stories and your screw ups. For arriving early and staying late. For having my back and making me better. Thank you. Dear Connie…thank you for letting my wet and smelly chest, shin protectors, helmet and shoes dry off in our dining room. It must look like an umpire exploded in our home. Dear God…how can I say this…thank you for this “thing” that you’ve blessed me with. 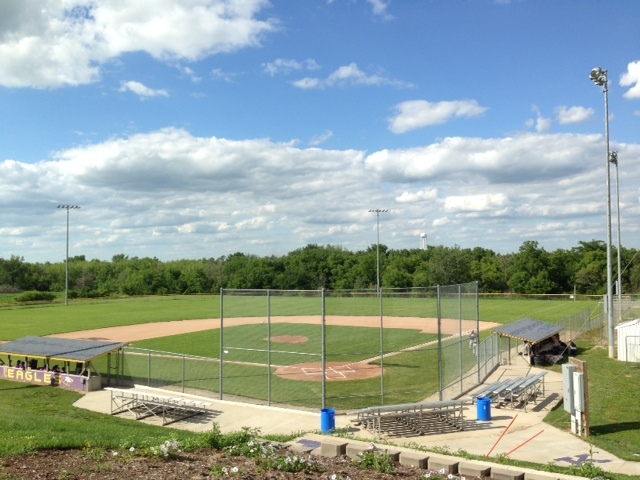 For sunny skies shining down on a well-groomed field. For healthy and lively children playing a game that I enjoyed playing and me still being a part of it. For the friendships of other officials and coaches that have happened. For friendly banter amongst longtime coaches. For catching a spectacular sunset as I stand along the first base line as the lights make the field glow. For the whistle of a red-winged black bird on the power line along the road as the game progresses. For the sound of laughter and applause for the kids as they celebrate a winning run. For the quiet drive home along a country blacktop, lightning bugs lazily drifting over cornfields….for all of these and more Lord…thank you, thank you…thank you. Thank you Lord. Two more games in the books. ← No Speedo. No problem. Assistant Coach ; why not? AC : That’s ridiculous, I can touch them if I want. I’ve never heard of that. Me : okay, I am sure of this rule. So, for the rest of this game just please don’t do that. LOL. They don’t “get it” that we’re only trying to prevent an issue from happening, and they don’t know the rules. Good story Sam!